This has been a year of rolling crises, some originating in developed markets and some in emerging markets, and the market has been remarkably resilient through all of them. 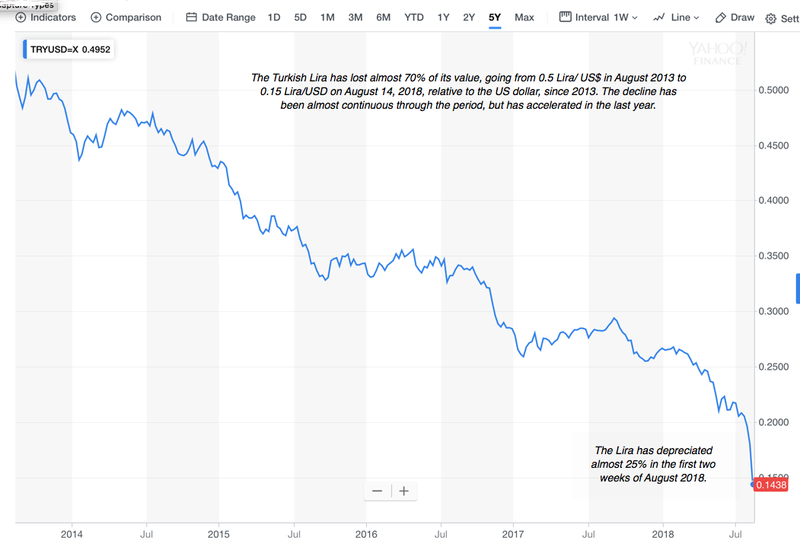 It is now Turkey's turn to be in the limelight, though not in a way it hoped to be, as the Turkish Lira enters what seems like a death spiral, that threatens to spill over into other emerging markets. There is plenty that can be said about the macro origins of this crisis, with Turkey's leaders and central bank bearing a lion's share of the blame, but that is not going to be the focus of this post. Instead, I would like to examine how Turkish business practices, and the willful ignorance of basic financial first principles, are making the effects of this crisis worse, and perhaps even catastrophic. The Turkish Crisis: So far! While it easy to blame the Turkish central bank for dereliction of duty, it has been handicapped by Turkey's political leadership, which seems intent on making its own central bank toothless. Rather than allow the central bank to use the classic counter to a currency collapse of raising central bank-set interest rates, the government has put pressure on the bank to lower rates, with predictable (and disastrous) consequences. 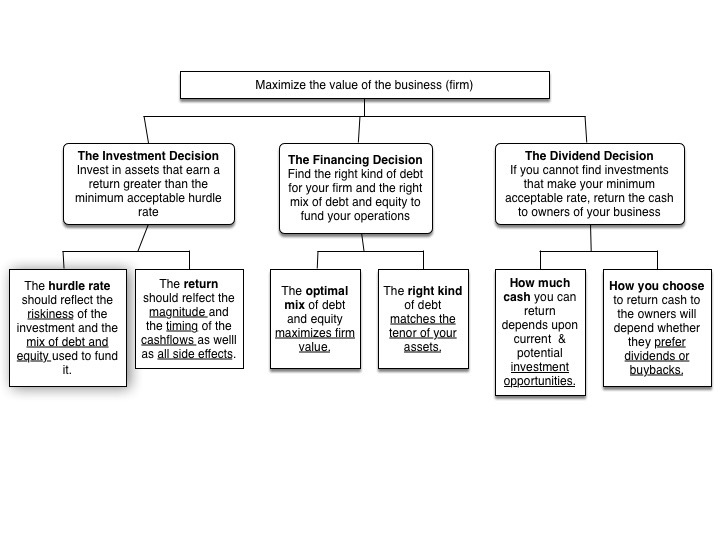 The financing principle operates at the nexus of investing and dividend principles and choices you make on financing can affect both investment and dividend policy. It is true that when most analysts look at the financing principle, they zero in on the financing mix part, looking at the right mix of debt and equity for a firm. 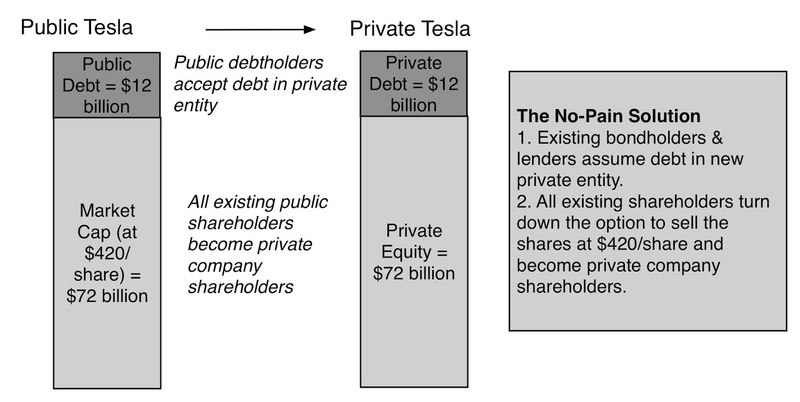 I have posted on that question many times, including the start of this year as part of my examination of global debt ratios, and have used the tools to assess whether a company should borrow money or use equity (See my posts on Tesla and Valeant). There is another part to the financing principle, though, that is often ignored, and it is that the right debt for a company should mirror its asset characteristics. Put simply, long term projects should be funded with long term debt, convertible debt is a better choice than fixed rate debt for growth companies and assets with cash flows in dollars (euros) should be funded with dollar (euro) debt. The intuition behind matching does not require elaborate mathematical reasoning but is built on common sense. When you mismatch debt (in terms of maturity, type or currency) with assets, you increase your likelihood of default, and holding debt ratios constant, your cost of debt and capital. In effect, your perfect debt will provide you with all of the tax benefits of debt while behaving like equity, with cash flows that adapt to your cash flows from operations. There are two ways that you can match debt up to assets. The first is to issue debt that is reflective of your projects and assets and the second is to use derivatives and swaps to fix the mismatch. Thus, a company that gets its cash flows in rupees, but has dollar debt, can use currency futures and options to protect itself, at least partially, against currency movements. While access to derivatives and swap markets has increased over time, a company that knows its long term project characteristics should issue debt that matches that long term exposure, and then use derivatives & swaps to protect itself against short term variations in exposure. Turkey: A Debt Mismatch Outlier? 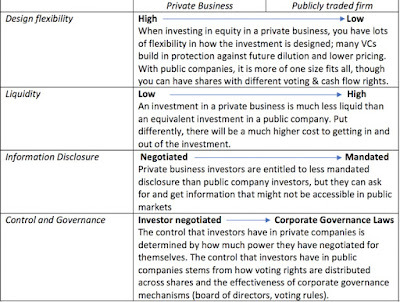 The argument for matching debt structure (maturity, currency, convertibility) to asset characteristics is not rocket-science but corporations around the world seem to revel in mismatching debt and assets, using short term debt to fund long term assets (or vice versa) and sometimes debt in one currency to fund projects that generate cashflows in another. In numerous studies, done over the decades, looking across countries, Turkish companies rank among the very worst, when it comes to mismatching currencies on debt, using foreign currency debt (Euros and dollars primarily) to fund domestic investments. 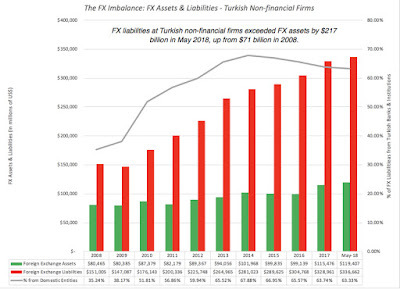 The numbers are staggeringly out of sync with Turkish non-financial service companies owing $217 billion more in foreign currency terms than they own on foreign currency assets, and this imbalance (between foreign exchange assets and liabilities) has widened over time, tripling since 2008. In May 2018, while about 80% of FX assets are Turkish non-financial firms are short term, only 27% of the FX debt is short term, a large temporal imbalance. 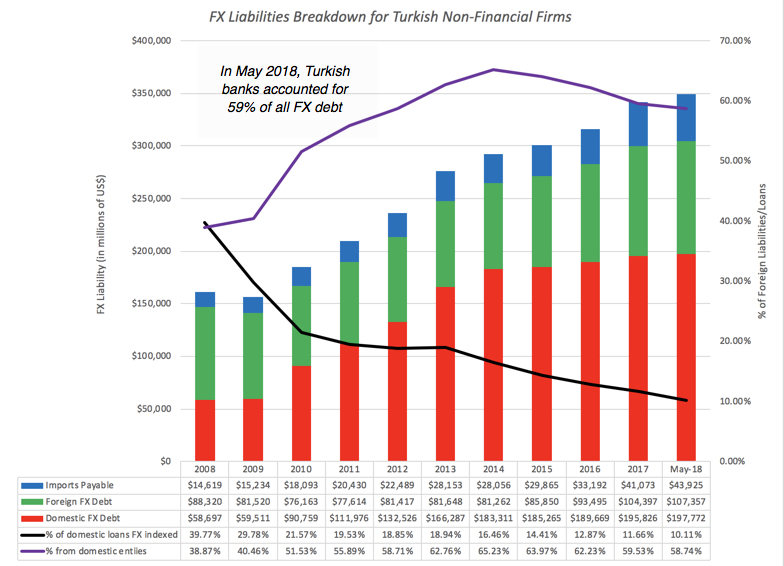 It is possible that the Turkish government may be able to put pressure on domestic banks to prevent them from forcing debt payments, in the face of the collapse of the lira, but looking at when the debt owed foreign borrowers comes due (for both Turkish financial and non-financial firms), here is what we see. 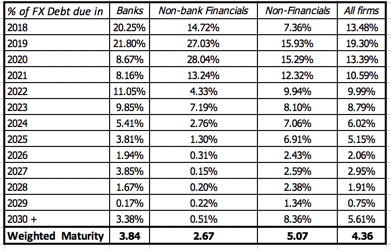 From a default risk perspective, though, the debt maturity schedule carries a message. 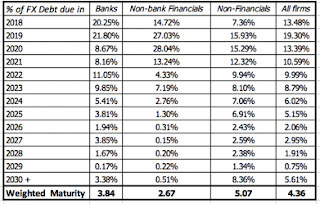 About 50% of debt owed by Turkish banks and 40% of the debt owed by Turkish non-financial service companies will be coming due by 2020, and if the precipitous drop in the Lira is not reversed, there is a whole lot of pain in store for these firms. 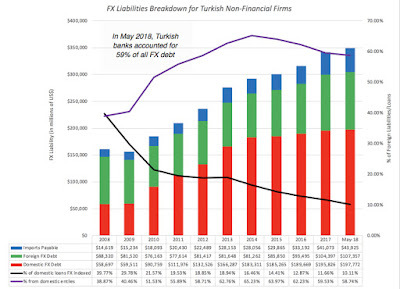 Turkish firms clearly have a debt mismatch problem, and the institutions (government, bank regulators, banks) that should have been keeping the problem in check seem to have played an active role in making it worse. Worse, this is not the first time that Turkish firms and banks will be working through a debt mismatch crisis. It has happened before, in 1994, 2001 and 2008, just looking at recent decades. If insanity is doing the same thing over and over, expecting a different outcome, there is a good case to be made that Turkish institutions, from top to bottom, are insane, at least when it comes to dealing with currency in financing. So, why do Turkish companies seem willing to repeat this mistake over and over again? In fact, since this mismatching seems to occur in many emerging markets, though to a lesser scale, why do companies go for currency mismatches? Having heard the rationalizations from dozens of CFOs on every continent, I would classify the reasons on a spectrum from acceptable to absurd. There are three scenarios where a company may choose to mismatch debt, borrowing in a currency other than the one in which it gets its cash flows. The mismatched debt is subsidized: If the mismatched debt is being offered to you (the borrower) at rates that are well below what you should be paying, given your default risk, you should accept that mismatched debt. That is sometimes the case when companies get funding from organizations like the IFC that offer the subsidies in the interests of meeting other objectives (such as increasing investment in under developed countries). It can also happen when lenders and bondholders become overly optimistic about an emerging market's prospects, and lend money on the assumption that high growth will continue without hiccups. Domestic debt markets are moribund: There are emerging markets where the only option for borrowing money is local banks, and during periods of uncertainty or crisis, these banks can pull back from lending. If you are a company in one of these markets and have the option of borrowing elsewhere in the world to fund what you believe are good investments, you may push forward with your borrowing, even though it is currency mismatched. Domestic debt markets are too rigid: As you can see from the debt design section, the perfect debt for your firm will often require tweaks that include not only conversion and floating rate options, but more unusual tweaks (such as commodity-linked interest rates). If domestic debt markets are unwilling or unable to offer these customized debt offerings, a company that can access bond markets overseas may do so, even if it means borrowing in a mismatched currency. 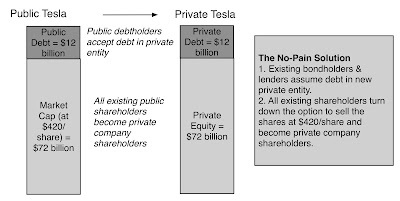 In all three cases, though, once the money has been borrowed, the company that has mismatched its debt should turn to the derivatives and swap markets to reduce or eliminate this mismatch. Speculate on currency: Mismatching currencies, when you borrow money, can be a profitable exercise, if the currency moves in the right direction. A Turkish company that borrows in US dollars, a lower-inflation currency with lower interest rates, to fund projects that deliver cashflows in Turkish Lira, a higher-inflation currency, will book profits if the Lira strengthens against the US dollar. Since emerging market currencies can go through extended periods of deviation from purchasing power parity, i.e., the higher inflation emerging market currency strengthens (rather than weakening) against the lower inflation developed market currency, mismatching currencies can be profitable for extended periods. There will be a moment of reckoning, in the longer term, though, when exchange rates will correct, and unless the company can see this moment coming and correct its mismatch, it will not only lose all of the easy profits from prior periods, but find its survival threatened. Currency forecasting is a pointless exercise, even when practiced by professional currency traders, and I think that companies should steer away from the practice. Everyone does it: I have argued that many corporate finance practices are driven by inertia and me-tooism rather than good sense, and in many countries where currency mismatches are common, the standard defense is that everyone does it. Many of these companies argue that the government cannot let the entire corporate sector slide into default and will step in to bail them out, and true to form, governments deliver those bailouts. In effect, the taxpayers become the backstop for bad corporate behavior. I am surprised by some of the arguments that I have heard for mismatching debt, since they suggest fundamental gaps in basic financial and economic knowledge. The mismatched debt has a lower interest rate: I have heard CFOs of companies in emerging markets, where domestic debt carries high interest rates, argue that it is cheaper to borrow in US dollars or Euros, because interest rates are lower on loans denominated in those currencies. After all, it is cheaper to borrow at 5% than at 15%, right? Not necessarily, if the 5% rate is on a US dollar debt and the 15% debt is in Turkish Lira, and here is why. 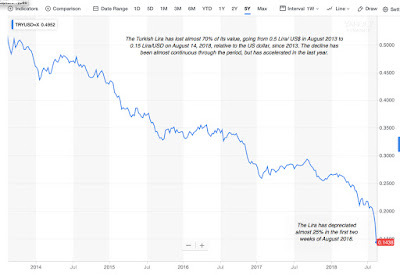 If the expected inflation rate in US dollars is 2% and in Turkish Lira is 14%, it is the Turkish Lira debt that is cheaper. Risk/Reward: There are some companies that fall back on the proposition that mismatching debt is like any other financial choice, a trade off between higher risk and higher reward. In other words, their belief is that they will earn higher profits, on average and over time, with mismatched debt than with matched debt, but with more variability in those profits. This argument stems from the misplaced belief that markets reward all risk taking, when the truth is that senseless risk taking just delivers more risk, with no reward, and mismatching debt is senseless. Governments should stop enabling debt mismatching, by not stepping in repeatedly to save corporates that have mismatched debt. That will increase the short term pain of the next crisis, but reduce the likelihood of repeating that crisis. Bank Regulators should measure how much the banks that they regulate have lent out to corporates, in mismatched debt, and require them to set aside more capital to cover the inevitable losses. That, in turn, will reduce the profitability of lending out money to companies that mismatch. Banks have to incorporate whether the debt being taken by a business is mismatched in deciding how much to lend and on what terms. The interest rates on mismatched debt should be higher than on matched debt. Companies and businesses have to consider what currency a loan or bond is in, when evaluating interest rates, and in their own best interests, try to match up debt to assets, either directly (in debt design) or using derivatives. Investors in companies should start breaking down the profitability of firms with mismatched debt, especially in good periods, into profits from debt mismatch and profits from operations, and ignore or at least discount the former, when pricing these companies. I don't think any of these changes will happen overnight but unless we change our behavior, we are designed to replay this crisis in other emerging markets repeatedly. While political and trade wars are brewing around the world, centered on globalization, the enduring truth is that the globalization genie is out of the bottle, and no political force can put it back. Encouraged to spread their bets around the world, investors have shed some of the home bias in their investing and added foreign equities to their portfolios. Even those that have stayed invested with companies in their own markets are finding that those companies derive large chunks of their revenues from foreign markets. In short, there is no place to hide from assessing global risk and analysts who bury their head in the sand are missing large parts of the big picture. 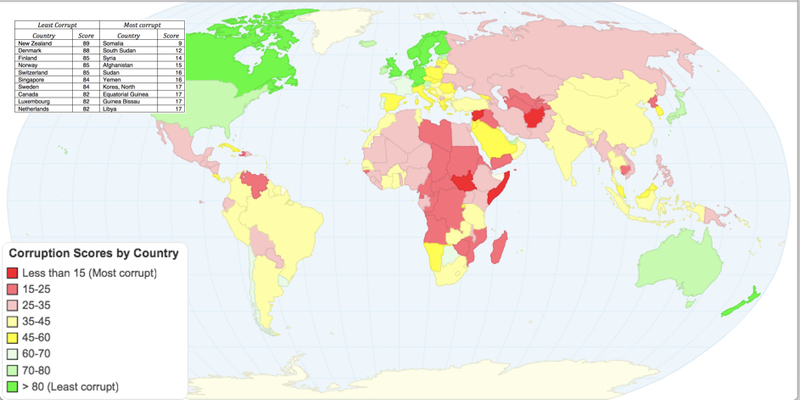 In this post, I revisit the assessments of country risk that I have made every year for the last 25 years and reiterate how to use those assessments when valuing companies or analyzing projects. The full version of this post is a paper that you can download and read, but I have to warn you that I am verbose and it is more than a hundred pages long. 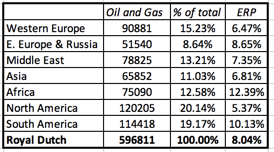 So, what makes investing or operating in one country more or less risky than another? Most business people point to three factors. The first is the prevalence of corruption in a country, with the corrosive influences it has on business practices and financial reports. The second is the increased exposure to violence from war or terrorism in some parts of the world, creating not just additional operating costs (for insurance and protection) but also the real possibility of a complete loss of the business. The third is the legal system for enforcing property rights, since a share in even the most valuable business in the world is worth little or nothing, if property rights are ignored or violated on a whim. In this section, we will look at the state of the world on these three dimensions. Why we care: Operating in an environment where corruption and bribery are accepted as common practice has two consequences for value. It is a hidden tax: You can view the cost of corruption as a hidden tax, paid not directly to the government but to its functionaries to get business done. As a consequence, the effective tax rate that a company pays in a corrupt economy will be much higher than the statutory tax rate. Since it is not legal for companies to pay bribes in much of the developed world, it is not explicitly reported as such in the financial statements but it is a drain on income, nevertheless. It can be a competitive advantage or disadvantage: In many corrupt economies, there are companies that are not only more willing but are also more efficient at playing the corruption game, giving them a leg up on businesses that face moral or legal restrictions on playing the game. While I am sure that there are some who will look at this chart and attribute the differences to culture, I think that it can be better explained by a combination of poverty and abysmal political governance. Why we care: At the risk of stating the obvious, operating a business is much more difficult, in the midst of violence and war than in safety. There are two consequences. The first is that protecting the business and its employees against the violence is expensive, with more security built into even the everyday practices. To the extent that this protection is not complete, there is the added cost of the destruction wrought by violence. The second is that in extreme cases, the violence can cause a business to fail. It is true that you can insure against some of these events, but that insurance is never complete and its cost will be high and reduce profit margins. Global Differences: The news headlines, especially about war and terrorism, give us clues about the parts of the world where violence is most common. To measure exposure to violence, though, it is useful to see indices like the Global Peace Index developed by the Institute for Peace and Economics, with low scores indicating the most and high scores the least violence. There are some surprises on this score. 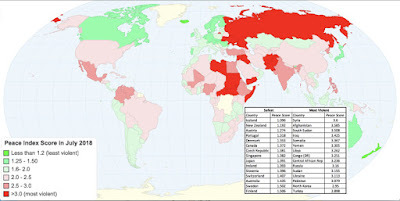 While some parts of the developed world, like Europe, Canada and Australia are peaceful, the United States, China and the United Kingdom don't score as well. Why we care: In valuation, we value a business or a share in it, on the assumption that that you are entitled, as the owner, to a share of its assets and cash flows. That is true, though, only if private property rights are respected and are backed up a legal system in a timely fashion. As property rights weaken, the claim on the cash flows and assets also weakens, reducing the assessed value, and in extreme circumstances, such as nationalization with no compensation, the value can converge on zero. 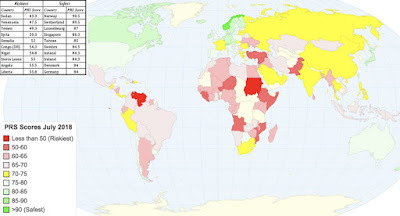 In 2018, property rights were most strongly protected in Oceania (Australia and New Zealand) and North America and were weakest in Africa, Russia and South America. There are few surprises here. Eight of the ten riskiest countries in the world, at least according to this measure, are in Africa with Venezuela and Syria rounding out the list. A preponderance of the safest countries in the world are in Northern Europe, though Taiwan and Singapore also make the list. The problem with country risk scores is that there is not only no standardization across services, but it is also difficult to convert these scores into numbers that can be used in financial analysis, either as cash flow or discount rate adjusters. There is one dimension of country risk where measurements have not only existed for decades but are also more in tune with financial analysis and that is sovereign default risk. Put simply, there is a much higher that some countries will default than others, and default risk measures try to capture that likelihood. While North America and Europe represent the greenest (and safest) parts of the world, you do see shades of green in some unexpected parts of the world. In Latin America, historically a hotbed of sovereign default, Chile and Colombia are now highly rated. The patch of green in the Middle East includes Saudi Arabia, indicating perhaps the biggest weakness of this country risk measure, which is its focus on the capacity of a country to meet its debt obligations. As an oil power with a small population and little debt, Saudi Arabia has low default risk, but it is exposed to significant political risk. While ratings agencies have been maligned as incompetent and biased, I think that their biggest weakness is that they are too slow to update ratings to reflect changes on the ground. In the last decade, it took almost two years after Greece drifted into trouble before ratings agencies woke up and lower the company’s rating. The sovereign CDS spreads are highly correlated with the ratings, but they also tend to be both more reflective of events on the ground and more timely. If you are lending money to a business, or buying bonds, it is default risk that you are focused on, but if you own a business, your exposure to risk is far broader, since your claims are residual. 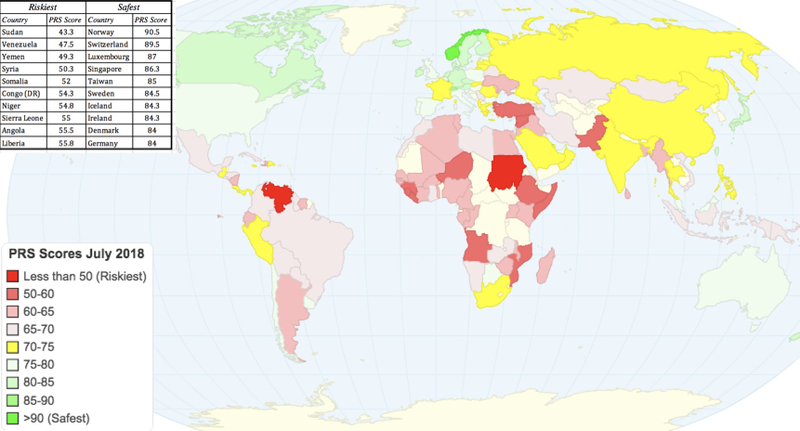 This is equity risk, and if there are variations in default risk across countries, it stands to reason that equity risk should also vary across countries, leading investors and business owners to demand different equity risk premiums in different parts of the world. 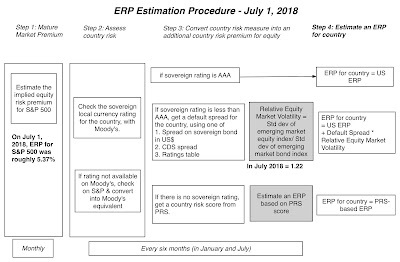 As a prelude to looking at different ways of estimating equity risk premiums across countries, let me lay out two basic propositions about country risk that will animate the discussion. Proposition 1: If country risk is diversifiable and investors are globally diversified, the equity risk premium should be the same across countries. If country risk is not fully diversifiable, either because the correlation across markets is high or investors are not global, the equity risk premium should vary across markets. One of the central tenets of modern portfolio theory is that investors are rewarded only for risk that cannot be diversified away, even if they choose to be non-diversified, as long as the marginal investors are diversified. Building on this idea, country risk can be ignored, if it is diversifiable, and it is this argument that some high-profile companies and consultants used in the 1980s to argue for the use of a global equity risk premium for all countries. The problem, though, is that country risk is diversifiable only if there is low correlation across equity markets and if the marginal investors in companies hold international portfolios. As investors and companies have globalized, the correlation across equity markets has increased, with market shocks running through the globe; a political crisis in Sao Paulo can drag down stock prices in New York, London, Mumbai and Shanghai. Consequently, being globally diversified is not going to fully protect you against country risk and there should therefore be higher equity risk premiums for emerging markets, which are more exposed to global shocks, than developed markets. 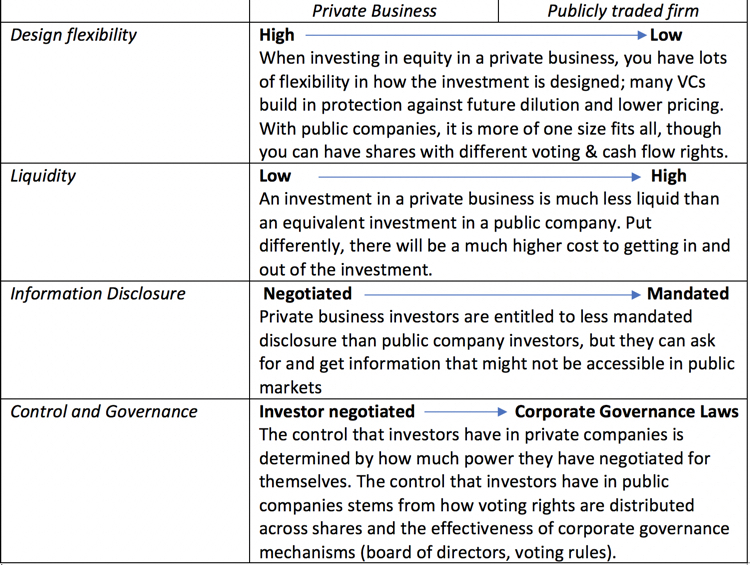 Proposition 2: If there are variations in equity risk premiums across countries, the exposure of a business to that risk should be determined by where the business operates (in terms of producing and selling its goods and services), not where it is incorporated. If you accept the proposition that equity risk premiums vary across countries, the next question becomes how best to measure a company or investment's exposure to that risk. 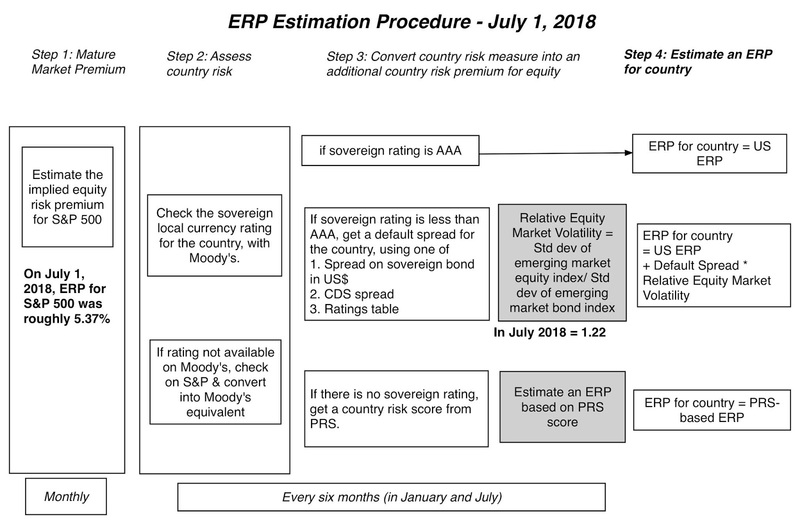 Unfortunately, a combination of inertia and bad logic leads many analysts to estimate the equity risk premium for a company from its country of incorporation, rather than where it does business. This is absurd, since Coca Cola, while a US incorporated company, faces significantly more operating risk exposure when it expands into Myanmar or Bolivia than when it invests in Poland. It stands to reason that to measure a company's equity risk premium, you have to look at where it does business. If the break down of Coca Cola's revenues, by region, strike you as being overly broad, note that this is the only geographical breakdown that the company provides. 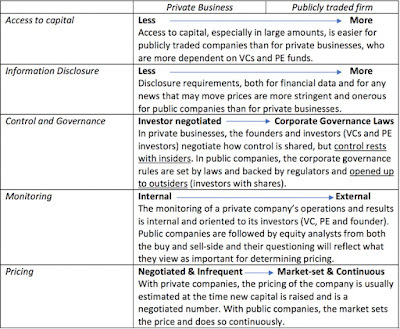 If there is one area of corporate reporting that requires more clarity and detail, it is this. You could even create a composite weighting that brings into account both revenues and production for a company, if you have the information. It is worth noting that many companies still adopt the practice of using the same hurdle rate for investments in different markets and if Coca Cola adopted this practice, they would be using the cost of equity of 8.52%, computed using their weighted average equity risk premium of 6.90%, or worse still a cost of equity of 7.30%, using an equity risk premium of 5.37%, based upon Coca Cola's country of incorporation,. Consider the consequences of this practice. It will reduce the cost of equity for the Nigerian investment and raise it for the Chilean and Canadian investments, and over time, it will lead Coca Cola to over invest and over expand in the riskiest markets. 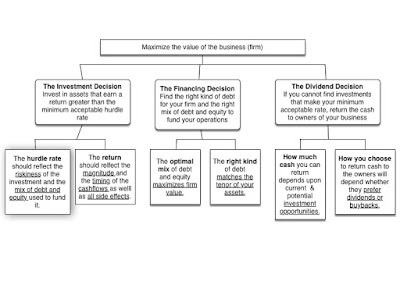 For a multi-business, multi-national company like Siemens, the estimation becomes even messier, since to estimate the cost of equity for a project, you will need to know not only where the project is situated (to estimate the equity risk premium) but also which business it is in (to get the right beta). 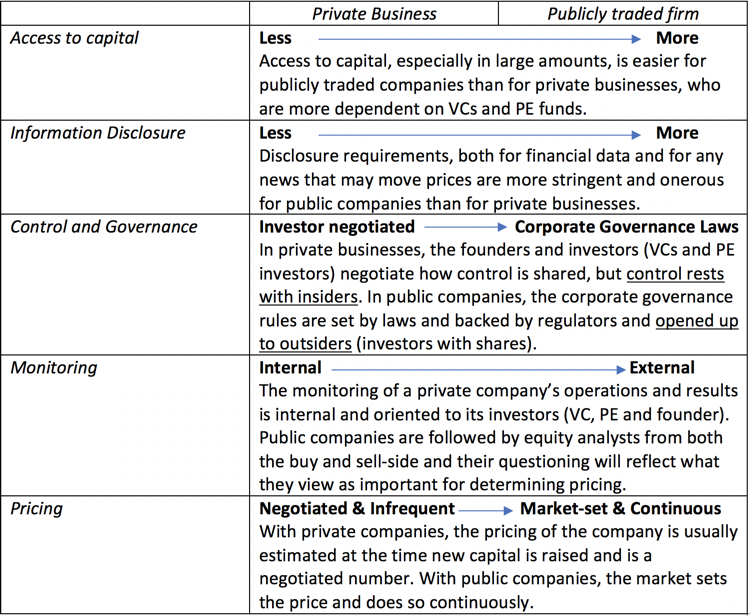 If you don't do intrinsic valuation, but base your investment decisions on pricing metrics (multiples and comparable firms), you may think that you have dodged a bullet, but that relief is fleeting. If equity risk varies across countries, you should also expect to see it show up in PE ratios or EV/EBITDA multiples, with companies in riskier markets trading at lower values. This can be viewed as an argument for finding comparable firms in markets of equivalent risk, but as we saw with Coca Cola and Royal Dutch, that can be difficult to do. In fact, since there are often far fewer companies listed in many emerging markets, you have no choice but to look outside your market for comparable firms, and when you do so, you have to at least consider differences in country risk, when making your judgments. If you do not, and you are comparing publicly traded retailers across Latin America, companies in riskier markets (like Venezuela, Argentina and Ecuador) will look cheap relative to companies in safer markets (like Chile and Colombia).